In 2007 we traveled to Spain for 11 days with Globus. Overall, our experience was very good. We had the best hotels and best food we have had on any of our European trips. Join us now for a brief review! Our journey started in Madrid, in the center of Spain, where we saw the 2800 room Royal Palace (from the outside), which is no longer used by the King. It, like several other large buildings we saw on our trip, had lovely sculptured gardens. We visited the Plaza de España (a name used in several cities), with its statue of the author Cervantes looking down on his fictional Don Quixote and his sidekick, Sancho Panza. We also visited the famous Prado museum. We didn't take any pictures there, but we learned a lot. The hotel we stayed in (the Husa Princesa) featured prints of paintings in the Prado behind each bed. Ours was "The Thread Spinners" by Velazquez, painted in the late 1640s. We had dinner at the Melon del Corregidor downstairs in their "Cave" (built in the 17th century), including songs performed by local musicians. The food was typical Spanish. Mine, for example, was a leg of lamb that literally overflowed the plate (it was over a foot long). The pork was served in a similar manner. The plaza outside the restaurant was typically European and featured some performers entertaining the crowd for tips. We took a side trip to El Escorial (interesting) and The Valley of the Fallen (less interesting). The monastery (formally the Royal Monastery of San Lorenzo de El Escorial), 28 miles NW of Madrid, was started in 1563 and has been the burial place for most Spanish kings. The Valley of the Fallen (formally the National Monument of the Holy Cross of the Valley of the Fallen) was created as a burial site and memorial for those killed in the Spanish Civil War (1936-39) by General Francisco Franco, as a national act of atonement. It is topped with the largest memorial cross in the world. 12,000 prisoners tunneled through the mountain to create a crypt, later designated a basilica. 32,000 bodies were buried anonymously nearby. The ceiling of the basilica (pictured below) contains 6 million pieces of mosaic. Our next stop was a side trip to Toledo, most famous for its cathedral, a 13th century Gothic structure, and El Alcazar, a stone fortification dating from the 3rd century. In the picture below, you can see the cathedral spire, and El Alcazar is the large structure on the right. We left Madrid on a high speed train, then took a tour of Cordoba (the least interesting town on our trip). We were approached numerous times by gypsy women with babies, begging. The highlight of Cordoba, though, is Mosque of the Caliphs, which has hundreds of marvelous arches inside. Expanded over the years, the style and material of the arches varies slightly as you wander throughout this huge building. (The walls of the Mosque are on the left below.) Note the detailed carving on the choir seats below the massive organ. Sevilla (Seville to us) has its own Plaza de España, built as part of the 1929 Spanish-American Exposition. This semi-circular building with a fountain and courtyard in front features many colorful tiled alcoves, each representing a different province. There are many other buildings in the surrounding area built for the Exposition. The Cathedral of Sevilla (arguably the 3rd largest in Europe) is where Columbus is buried (a controversy recently verified by DNA). Columbus' remains are entombed in the crypt at right, below. The city features the lovely Santa Cruz Quarter, filled with delightful small shops and eateries, as well as private homes. We ate outside at both locations pictured. Dinner at La Albahaca was outstanding. There is also a bull fighting arena and plenty of Flamenco dancing in Sevilla. Lastly, we visited the famed Alcazar, a royal palace that was originally a Moorish fort. It has lovely gardens. From Sevilla, we took a long bus ride to Torremolinos, stopping along the way at Gibraltar. Now this is a strange place! Right at the southern tip of the Iberian peninsula, it is owned by Great Britain, and you have to pass through customs. Then, almost immediately, you drive (or walk) across the airport runway, which runs horizontally in front of the famous Rock of Gibraltar we have all heard of. You can see the airport control tower in the left picture below. We had just walked through customs at this point. In the picture on the right, taken by the Straight of Gibraltar, we see the Ibrahim-al-Ibrahim Mosque, a gift from Saudi Arabia's King Fahd in 1997. 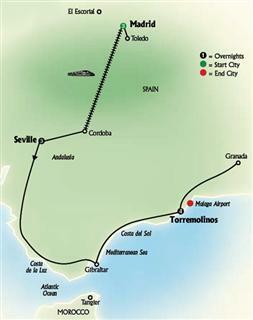 Made famous in part by Michener's novel The Drifters, Torremolinos was just a poor fishing village along the Costa del Sol until the late 1950s. Now it is a thriving, if slightly tacky, beach resort with high rises, a la Myrtle Beach. In the summer it is besieged by tourists, many from the UK, who crowd the beach with not an inch to spare. It is said to be so popular with gay travelers that there are no straight nightclubs. When we were there, it was too cool and damp for much beach use, but the sand, though somewhat dark, was very nice. We actually found the area much nicer than we had been lead to believe it would be, and the food was excellent. (We highly recommend the Cetus restaurant, right on the beachway. The second time we ate there, we had a fabulous local specialty: fish cooked whole, completely covered in salt. The salt is cracked away at your table, the skin removed, and the fillets removed from the bone. Absolutely delicious, with no salty nor fishy taste.) The first picture below is the view from the bus as we approach Torremolinos. We looked forward to this opportunity to briefly explore a different culture, and we are glad we went, but we are unlikely to return. Once was enough! We took a high speed ferry (that's what they called it, but it wasn't very fast) from Spain to Morocco across the Straight of Gibralter, then met a guide who took us around first by bus, then by foot. We were pestered quite a bit by people trying to sell us junky souvenirs, despite an extra guide hired to "protect" us. We also visited a Moroccan rug factory with a seemingly endless supply of rugs. Salesmen chased us around trying to convince us to buy something. We ate lunch at a local restaurant, complete with music (our guide has joined the group in the picture below) and a belly dancer. It was interesting to note a few minutes after the dance completed that the young lady came back through the restaurant in traditional garb, including a head covering. The food was good, though not likely something we would seek out on our own. And, surprisingly, the local Moroccan wine was good, too! The main attraction in Granada is La Alhambra, an ancient palace and fortress of the Moorish monarchs and reportedly the second most visited site in Europe after the Vatican. It is a huge property, with numerous buildings and gardens, many of whose sculptured shapes mimic the palace walls. The star shape below is a ceiling. Now this was one of the most interesting spots on our visit to Spain. Ronda, an hour and a quarter northwest of Torremolinos, is a delightful village in the mountains, with old Ronda and new Ronda separated by a deep chasm connected by a bridge. The views are stunning. Ernest Hemingway and Orson Welles both resided in Ronda for many years. There is also a small but important bullring in Ronda, which is considered the birthplace of modern bull fighting.